Diesel’s prototype engine circa 1892. The world’s biggest lithium ion battery has been launched in South Australia, with Premier Jay Weatherill declaring it an example of SA “leading the world”. 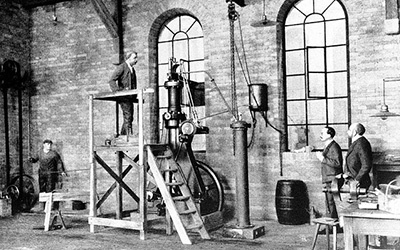 The first diesel generator was patented in 1892. Go, Go, SA. That reliability was tested before the battery’s official launch when it began dispatching around 59 megawatts into the state’s electricity network on Thursday afternoon as the state hit temperatures above 30C. How fragile is this system? The facility has the capacity to power 30,000 homes for up to an hour in the event of a severe blackout but is more likely to be called into action to even out electricity supplies at less critical times. There are 673,540 households in South Australia and the Big Battery can supply 4% of them for an hour with electricity, or all of the state for a bit over two minutes. SA peak demand of about 2000 MW, so the world’s biggest battery can supply only 1.25% of the second smallest state in Australia, or 0.1% of the AEMO grid peak requirement. [And that's only for four hours]. Widespread thunderstorms swept across the state overnight, with lightning strikes damaging some powerlines, including in the Jamestown area. Northern Areas Council mayor Denis Clark said a number of nearby farmers were left blacked out. “They were wondering if the Premier would supply some long extension cords so they could tap into the battery to get some power,” he said. SA taxpayers will pay up to $50 million in subsidies to Tesla and Neoen over the next 10 years. In return, the State Government will have access to 70 per cent of the energy stored within the battery. In August the diesels were going to cost about $110m. Premier Jay Weatherill won’t reveal the price of leasing or purchasing the turbines, but says it’s included in the Government’s $550 million energy plan. So they cost more than $111m but less than $500m? The battery and its clean and green halo is in stark contrast with the bank of diesel-powered fast-start generators which have also just been constructed. They are located at two different sites in Adelaide, built in a rapid 58 days by United States firm APR Energy. Those generators deliver a combined 276MW and were connected to the broader electricity grid on November 13. They are powered by diesel fuel, but will only be switched on in a power shortfall emergency to quickly step into the breach if demand exceeds supply. They can be at full speed within just 8 minutes, from a standing start. The batteries may last long enough to get the diesels up and running. (Depending on the size of the shortfall). Not long back, Port Augusta had a thirty-one year old coal plant generating 520MW. The Premier could have spent $30 million to keep it going. Though coal resources are running very low in SA, so coal would have to be shipped in. It’s still cheaper than the hire-purchase-diesel-battery-wind-solar solution.